Milwaukappella 2019 - A Celebration of the Unaccompanied Human Voice! Milwaukappella is a day-long a cappella workshop for high school and college students followed by an evening concert featuring students from the dayside classes plus a show-stopping performance by a nationally known headline band. Milwaukapppella’s music director Lee Stovall and the festival’s producer Peter May have done an outstanding job picking headliners for each of the first four years of the festival’s existence. They’ve served up talented veterans like Six Appeal, re-configured super-groups like The Transit Vocal Band and young up and comers like Vocalight! Lee and Peter are listening to demos from a dozen different bands now, narrowing the list. We can promise this; whoever is booked for Milwaukappella 2019, they will stage a rocking, hands-in-the-air, unforgettable show but that’s not all. Milwaukappella headliners must be good teachers as well! 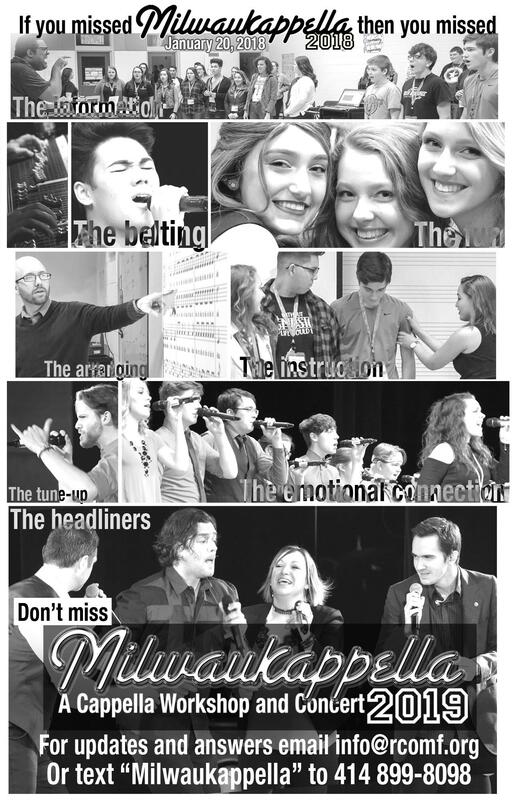 Milwaukappella isn’t just a concert; it’s a unique opportunity for aspiring high school and college age a cappella students to attend classes taught by seasoned instructors and headliners who can offer the experience and knowledge gained by professional, touring musicians! Throughout the day of Milwaukappella there will be sessions on vocal percussion, arranging, vocal technique, presentation, conveying emotion, belting, choreography and even tips on taking the next step in a music career – getting into college a cappella groups and even going pro! At the end of the day, students apply their skills by opening the evening performance. The kind of opportunity offered at Milwaukappella isn’t available anywhere else at any price! Milwaukappella takes place in mid-January at the beautiful South Milwaukee Performing Arts Center. Check back for the date and time. Student Seminar tickets are $45/student in advance, $55/student the day of the event. The price includes classes, lunch, snacks, dinner and a great seat for the evening show. Advance tickets for the evening performance start at $15 for student and seniors, $19 for adults. Family-savings packages are available. Children 4 and under are free. Families are encouraged to attend! The Milwaukappella headliners will be announced in mid-May. They’ll be featured on the South Milwaukee PAC website as well as in mailings from the PAC. Follow “BUY” links. Workshop tickets will be offered on the same page as show tickets. Milwaukappella has been sponsored right from the start by Milwaukee’s premier investment advisory firm Landaas and Company investments. Why would an investment firm sponsor an a cappella festival? Singing is in the Landaas DNA. The firm’s founder, Bob Landaas, is an aficionado of all vocal forms and the employees of Landaas and Company are known for being in bands and incorporating singing into all company gatherings. So, it’s no surprise that Landaas and a cappella go together! The phrase “a cappella” is Italian for "in the manner of the chapel.” While a cappella has devotional roots, the vocal style often blossomed where instruments were forbidden or unavailable; in poor or remote areas and among slaves and prisoners. Modern a cappella began with Gospel then Doo Wop in the 50’s, Vocal Jazz in the 80’s then rap and hip hop in the 90’s. The latest blossoming of a cappella has been driven by movies like Pitch Perfect 1, 2 and 3 and TV shows like Glee, The Voice, American Idol and The Sing Off as well as Billboard hits by The Pentatonix, Street Corner Symphony and Straight No Chaser. Proceeds from the Milwaukappella performance will be used to support charitable efforts of The Rotary Club of Mitchell Field. Rotary is the world’s oldest and largest service organization, famous for End Polio Now, its effort to rid the world of polio. Locally, RCMF funds student scholarships and grants to local non-pro ts as well as delivering food to families for Thanksgiving, hosting a Christmas party for Goodwill workers, and organizing a prom for senior citizens. The club has been serving Cudahy, Franklin, Oak Creek, South Milwaukee, St. Francis and Bayview since 1958. A portion of Milwaukappella proceeds also go to South Milwaukee Music and South Milwaukee Music Parents Association to support the district’s music programs. For more information about Milwaukappella, call or text Peter May at 414 899-8098. Write to pete@petemay.com to be added to our mailing list so you'll be informed of all developments regarding the festival.